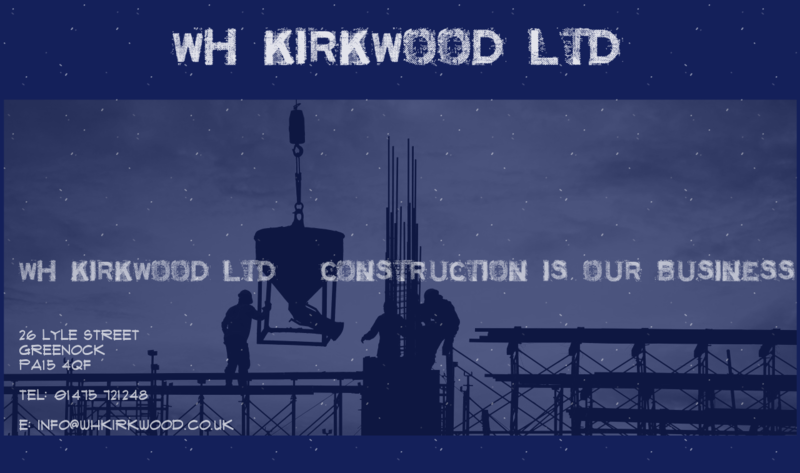 WH Kirkwood – WH Kirkwood Ltd – Construction Is Our Business. Formed in 1902, W H Kirkwood Ltd is now a very well established construction company based in Greenock serving West Central Scotland. We are predominantly Main Contractors but also undertake direct works including joinery, brickwork, groundworks, shopfitting, etc. No job is too small and few are too large. Our recent works include Church re-roofing and refurbishment, Distillery refurbishment, reconstruction of Victorian Fernery at Benmore Gardens near Dunoon, office refurbishment at Scarlow Street, Port Glasgow for Riverside Inverclyde. We have just completed the refurbishment of the Charles Rennie Mackintosh designed gallery at the Glasgow Art Club Currently we are refurbishing the existing timber walkway at Wemyss Bay Pier. Our Clients vary from Local Authority, to NHS Trusts to Private. WH Kirkwood © 2019. All Rights Reserved.